I’ve long been fascinated with writing spaces. Whether they were the writing nooks of famous authors (or, even better, their personal writing sheds) or the desks of freelancers and other lesser knowns or even just the organization design suggestions of Better Homes and Gardens or Pottery Barn, I’ve spent many a long hour examining the structure of others’ writing spaces. I’m a big fan of Roald Dahl’s writing shed. It’s because I never had a writing space of my own before; at least, not a regular one that didn’t have some other primary purpose first (homework/studying, etc.) After years of collecting ideas and ripping pages out of magazines, I’ve finally designed my own perfect writing space. I love it. It’s so pretty, so functional, and just so me. Kristin, host of the Where Writers Write guest blog series was kind enough to interview me about my writing space and my writing routine (for those of you interested in how the 14-hours-a-week of scheduled writing time is going…) Check the post out for more photos of my not one but two writing desks. Wow! It’s so adorable! I have only a box bedroom as my writer’s space, so it’s a nightmare actually getting anything done! I don’t even have a desk! I have to go out and write in places like college, the library and coffee shops! Good luck with you writing endeavors! That’s how my life was for so long! I’ve never had enough space/lived anywhere permanently enough to have an official writing space. It’s such a relief to finally have one. Thank you! Good luck in your own writing endeavors! I’m fascinated by writing spaces as well, and Dahl’s is one of my favorites as well. I’m fortunate to have my own office, unfortunately I can never seem to keep it clean! Clean is overrated. Offices/desks are just for us, so as long as you know where everything is in the clutter, I think it’s just fine! Yes it does! And when I fold it back up, it has a little latch and it stays closed shut and looks very decorative up there on the wall. That is the hard part about designing the perfect work space–if you work/write from home, the home and family part is so tempting! It’s hard to shut yourself away, no matter how wonderful a space it is! That first one is beautiful. I am sure I wouldn’t get a think done though. Too tide and I’d be afraid to mess it up. Thanks, I love that antique desk (that’s the one you were referring to, no?) I don’t have to worry about keeping it neat–there are SO many little hidden drawers that I just hide all the messes away. Trust me, it’s deceptive. And totally functional. SUCH a neat post. I am in the daydream stages of planning my perfect writing space. I have a pretty awesome one in the house I have now, but in my next house…I have fantasies about my writing office, LOL. Your space looks AWESOME! 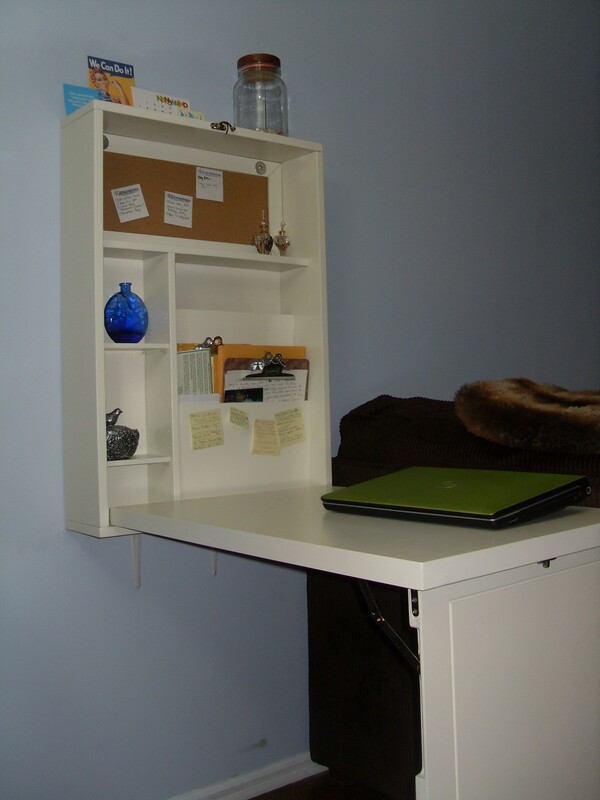 I love the fold out desk and that it has shelves inside. It’s like a little secret writing getaway! Awesome! What do you dream about putting in your fantasy writing space/what would be different from your current one? The daydreaming part is the most fun, when you can consider so many different themes and layouts…Hope it turns out as wonderful as you imagine! Well…the inner Tolkien nerd in me wants to have a hobbit hole for a writing shed one day! That would be my absolute dream. If that doesn’t happen, I’d love to have a cottage-themed room with lots of bright light and pretty soft colors. What about you!? That treehouse writing space sounds absolutely enchanting, especially in the throes of a storm. What an enriching experience. I’ve always been jealous of people who had treehouses. If we had one, I would have written in it, too. How magical for you! I love treehouses! I never really appreciated the treehouse until I was older and realized how awesome it is! Also, as much as I like looking at writing spaces online, I also love looking at innovative treehouse designs. It’s an addiction. That’s awesome! Very interesting. I don’t quite have a writing space, but I have a ritual, when I can: I always open the nearest window, light a candle, and have a cup of tea in reach. Goodluck with your space. That is a very unusual ritual–how did that start? The candle lighting, I mean, because I totally understand/respect the need for a bottomless cup of tea. Haha, I guess it started because my room was always really cold and for some reason I felt the candle warmed it up. A little delusion can go a long way. My writing space is about the same size as yours! I’m a fan of cozy over spacious though… there’s something comforting about working in what feels like a little cocoon. Speaking of which, I have a feeling you’ll love this blog I stumbled across the other day — it’s a writer in Brooklyn who shares tips and details about tiny apartment life. I cannot get enough of it. It’s http://www.readingmytealeaves.com/ — do enjoy! 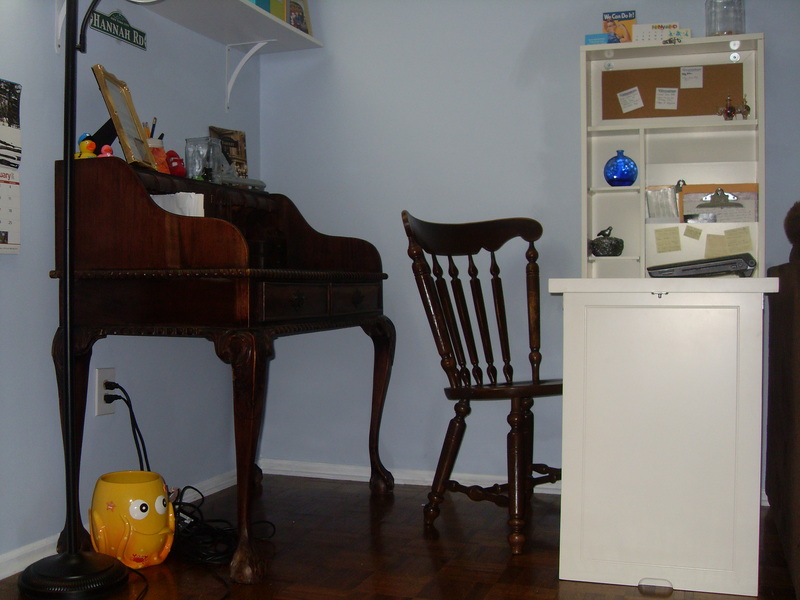 I am also addicted to looking at others’ writing spaces; thanks for a post full of them! I love that desk! My dad bought it for me, secretly, the summer I turned eighteen. We had gone to a fair together and there was an antique dealer there and I kept sighing over this desk. A few days later, my dad brought it home as a surprise. That’s hilarious that we have the same desk, especially being so far apart, geographically. The secret compartments are one of my favorite party games, of sorts. When my boyfriend’s family helped me move into my new place, I told the boys that there are two hidden compartments in it. They searched for nearly a half hour and couldn’t find them! They thought I was making it up! Eventually I showed them where they were and now they call it my “drug desk” because apparently that’s all the hidden compartments are good for? I don’t know, but it’s funny. I like the contrast of the two desks … sleek for the keyboard and classic/traditional for the pen. Thank you for sharing. Looks great.